Percentage of Sri Lankan Tamils per district based on 2001 or 1981 (cursive) census. The Sri Lankan Tamil dialects or Ceylon Tamil dialects form a group of Tamil dialects used in the modern country of Sri Lanka by Sri Lankan Tamil people that is distinct from the dialects of modern Tamil spoken in Tamil Nadu and Kerala states of India. Tamil dialects are differentiated by the phonological changes and sound shifts in their evolution from classical or Old Tamil (300 BC - 700 CE). It is broadly categorized into four sub groups: Jaffna Tamil, Batticaloa Tamil, up country Indian origin Tamils and Negombo Tamil dialects. These dialects are also used by ethnic groups other than Tamils such as Sinhalese people, Sri Lankan Moors and Veddas, who consider them to be distinct. These dialects are not mutually intelligible with Indian Tamil dialects, which some of the native speakers consider to be a separate language. As Tamil is a diglossic language the differences between the standard written languages across the globe is minimal but the spoken varieties differ considerably. The spoken varieties in Sri Lanka although different from those of Tamil Nadu share some common features between the southern dialects of Tamil Nadu and the northern Sri Lankan Tamil dialect, the language of Jaffna. Sri Lankan Tamil dialects retain many words and grammatical forms that are not in everyday use in India, and use many other words slightly differently. The Sri Lankan Tamil dialects are less influenced by Sanskrit and the western languages, although there are western and Sanskrit loan words in day to day usage. 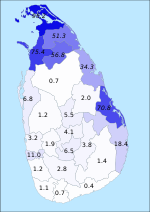 In general Sri Lankan Tamil dialects are considered to be more conservative than the continental Tamil dialects. The Negombo Tamil dialect, used in the Negombo area by bilingual fishers who otherwise identify themselves as Sinhalese, has undergone considerable morphosyntactic convergence with spoken or colloquial Sinhala as a consequence of contact with it. It has also developed a number of other grammatical traits under the probable influence of Sinhala, including a postposed indefinite article, an indefinitizing postclitic –sari (apparently modeled on Sinhala –hari), and case assignments for defective verbs that follow the Sinhala, rather than Tamil, patterns of agreement. Batticaloa Tamil dialect is shared between Tamils, Moors, Veddhas and Portuguese Burghers in the eastern province. The Tamil dialect used by residents of the Trincomalee district has many similarities with the Jaffna Tamil dialect. According to Kamil Zvelebil a linguist, the Batticaloa Tamil dialect is the most literary like of all spoken dialects of Tamil, and it has preserved several very antique features, and has remained more true to the literary norm than any other form of Tamil while developing a few striking innovations. Although Batticaloa Tamil has some very specific features of vocabulary, it is classified with other Sri Lankan Tamil dialects as it is related to them by characteristic traits of its phonology. It also maintains some words that are unique to present day . Estate Tamil (ET) is a dialect spoken by the descendants of indentured South Indian labourers who were brought to Sri Lanka during British colonization and South Indians who migrated to Sri Lanka for better prospects. ET is often misunderstood as Indian Tamil as the people who speak this dialect can trace their ancestry back to South India but much research has not been done regarding this dialect due to the misunderstanding that there is absolutely no difference between ET and Indian Tamil. However research shows that ET is a dialect that heavily differs from Indian Tamil for multiple reasons. The ancestors of ET speakers migrated from different parts of South India and they spoke different dialects of Tamil. For example, grandmother for Pallar community was “attay” while for Kudiyar it was “ammayi”. In the last century these different dialects of Indian Tamil co-existed in close proximity in the hill country and it evolved into what is currently known as Estate Tamil. Moreover there are dialectal differences within ET due to different types of language contact. Language contact between the different dialects of Indian Tamil and Sinhala after Sinhala labourers also started working in tea and rubber plantations had a considerable impact in the development of ET as a separate dialect from Indian Tamil. The geographical distance between the two dialects of Tamil, ET and Indian Tamil has also impacted the evolution of ET as a separate dialect. ET has been in Sri Lanka for over a century and as mentioned above has come into contact with a different language Sinhala. Moreover, ET has been exposed to different dialects of Tamil within Sri Lanka such as Jaffna Tamil which has also caused changes in ET. This shows that ET is indeed different from Indian Tamil. There are phonological differences between the two dialects. Out of the consonants /b/d /D/ /j /g/ are voiced stops in Indian Tamil while in ET they occasionally occur as voiceless stops in loan words. For example, ‘bayam’ (fear) in Indian Tamil is “payam” in ET. Studies have identified that there are three distinctive nasals in Indian Tamil but the phonemic differences of these nasals are slowly fading away in ET. For example maɳam (smell) in Indian Tamil is manam in ET. ‘ɳ’ in ET occurs only in loan words or preceding /c/ and /ɳ/ in Indian Tamil is realized as /n/ in ET. For example ‘koɳjam’ (a little) in Indian Tamil is ‘koɳcam’ in ET. Morphological differences can be found between Indian Tamil and ET as well. In Indian Tamil, /ooDa/ /uDaya/ and /kka/ are genitive case markers but in ET these case markers have slights variations such as /ooDa/ is /ooTa/ in ET, /uDaya/ is /uTaya/, /uTTu/ and /atu/ in ET. Thus, it is clear that ET is a different dialect from Indian Tamil as the different dialects of Indian Tamil that evolved into ET due to close proximity with each other and language and dialectal contact between ET, Sinhala and other dialects of Sri Lankan Tamil. ^ a b Schiffman, Harold F. (30 October 2009). "Language Shift in the Tamil Communities of Malaysia and Singapore: the Paradox of Egalitarian Language Policy". ccat.sas.upenn.edu. Retrieved 18 February 2019. ^ Lehmann, Thomas (1998). "Old Tamil". In Steever, Sanford. The Dravidian Languages. Routledge. p. 75. ^ Annamalai, E.; Steever, S. (1998). "Modern Tamil". In Steever, Sanford. The Dravidian Languages. Routledge. p. 100-128. ^ a b Zvelebil, Kamil (June 1966). "Some features of Ceylon Tamil". Indo-Iranian Journal. 9 (2): 113–138. ^ a b Bonta, Steven (October 12, 2003). "Contact-Induced Morphosyntactic Realignment in Negombo Fishermen's Tamil". South Asian Language Analysis Roundtable XXIII. The University of Texas at Austin. Archived from the original on February 29, 2008. ^ Kuiper, L.B.J (March 1964). "Note on Old Tamil and Jaffna Tamil". Indo-Iranian Journal. Springer Netherlands. 6 (1): 52–64. doi:10.1007/BF00157142. ^ Shanmugathas, A. "Yalpana Thamilil Sangath Thamil" (in Tamil). Retrieved 1 April 2010. ^ a b c d Kadurugamuwe, N. (1994). Estate Tamil: A morphosyntactic study(Unpublished doctoral dissertation). ^ Wijeratne, W. M. (2009). Estate Tamil: A new variety of Tamil. 43-58. Kadurugamuwe, N. (1994). Estate Tamil: A morphosyntactic study (Unpublished doctoral dissertation). Subramaniam, Suganthy (2006). Folk Traditions and Songs of Batticaloa District. Kumaran Publishing. p. 99. ISBN 0-9549440-5-4. Wijeratne, W. M. (2009). Estate Tamil: A new variety of Tamil. 43-58. This page was last edited on 10 April 2019, at 06:25 (UTC).